The Gnat was the creation of W.E.W. "Teddy" Petter, a British aircraft designer formerly of Westland Aircraft and English Electric. Petter believed that a small, simple fighter would offer the advantages of low purchase and operational costs. New lightweight turbojet engines that were being developed enabled the concept to take shape. One of the hallmarks of the Gnat's design was its compact size. However, to achieve such a size, its systems were closely packed, making maintenance more difficult. Some of its systems were not noted for their reliability and the aircraft suffered from high operating costs. There were also issues that its cockpit was cramped and obstructed the instructor's forward visibility. Furthermore, the limited weapons load and reduced fuel capacity – both designed to reduce overall kerb weight – meant that it could not operate for protracted periods. Despite the shortcomings, the Gnat and its predecessor the Folland Midge were praised by the RAF evaluation and the test pilots. The lower cost of the Gnat, its compact dimensions, as well as "good press" for the aircraft in air shows, were among the factors that prompted a spurt in its export sales. Aircraft were sold to Finland, India and Yugoslavia with India having much success with their locally built 'Ajeet' aircraft. Many survive in museums and several are still airworthy. From the dim recesses of my mind, I seem to recall this one time having 1974 stamped on the inside of the fuselage, but whatever its original date of manufacture, it isn't a new kit. It is also very much a series 1 kit with a whopping 34 parts. No cockpit to speak of, just two seat shapes and one pilot. 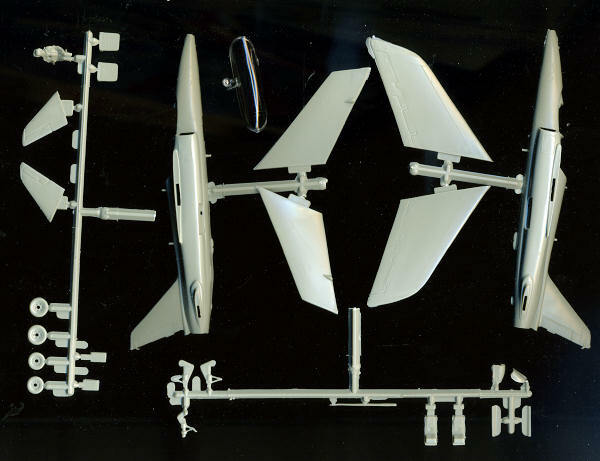 The rest of the kits is pretty simple with no stores or wing tanks, a common item on the Gnat. Of course, this is the Red Arrows boxing and so those would not be used during the performance. I seem to recall a previous issue being in red plastic but fortunately, this one is in standard grey. There is some flash but overall, the kit has held up well over the years. The only option is wheels up or down, and actually, up wouldn't be a bad idea if you don't mind cobbling together a stand. The instruction sheet is large and has four well illustrated construction steps. Half of the instruction sheet space is taken by two large four views. 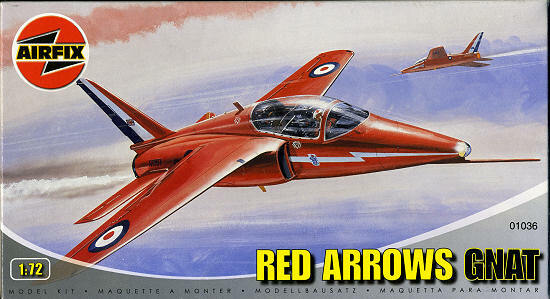 You can do any of the ten Red Arrows planes or any of the ten Yellowjackets aircraft. Humbrol paint references, of course. I'm not really sure just how opaque the white parts of the decal sheet are, but the decals are fairly well done. Not as crisp as one would expect from aftermarket, but fine for a kit of this sort. The only paint option is one of the Yellowjackets planes has a black fin, undoubtedly to hide exhaust soot as this was common practice with the #4 Thunderbirds plane until the F-16 era. You won't win contests with this unless you do major work on it, but for the casual modeler or someone who just wants to have a Gnat trainer, this is a perfectly adequate kit. Not much in the way of aftermarket, though I do believe that Modeldecal did a 4 FTS scheme on one of their sheets. Thanks to me for picking up this old favorite. Should have kept the $2.50 one I bought 25 years ago.